This app had all that I need. The only gripe I have is It won’t display in lbs, even though I have made it so in settings. I love this app. After searching the App Store high and low for an app that lets me easily track my eats, water and exercise AND also lets me share it with a friend via email, I finally found this app. The developer answered my questions speedily, too. That's a plus. Easy, Good. Could be great. Like it. Use it. Has lots of food with Weight Watcher points in database. Wish it had fruit/veggie counter. Took mea while to figure out how to put foods into my "favorites." But works well for me. This is not a user friendly app, I can't find the simplest items unless I eat out and it loses all of my entries after I have gone to the trouble to find them. I know it is only 99 cents, but this is not worth a penny. After two days of trying to work with the app, I got so aggravated that I asked for a refund. All this crap did was make me angry trying to find the food items that I cook, not order out and about 95% of the food items I can't find. And when I do find them and save it all disappears. Don't bother paying for this, your better off just throwing your money into the garbage can. I'm sorry but I ended up hating this app. Even when I clicked on the help, there was nothing useful there to help me have a better understanding on how to find any item I wanted. Save your and your sanity. This app works great to track my weight watcher points which I enter the food points and save as at times the points aren't the Same at least for the old points I use. Great to track workouts and water also and very user friendly! At first I was excited about this app, but once I started using, it was the absolute worst! I cannot believe how inapt this app is. The foods you eat aren't available and selections are very limited. It is not worth the $1. Believe me, it's the absolute worst! Love this app Have used for years New iPhone 7 message "will slow down phone Needs update " So it won't open it Really don't want to give up this app!! Outstanding app, which keeps getting better (such as integrating the camera scanner for UPC bar codes to get nutritional information). I've used it since December 2013 and find it easy to track exercise and what I eat. Quick and easy to record and excellent graphs as overview of what has been happening. Not easy to use, didn't show any of the foods I normally eat. The calorie counts for the activities are way way way off. Don't waste your money like I did. I deleted it. I started using Trackit in July of 2012 and really love it. It's easy and fun to use with the sound effects and the graphs are really cool too~ you can watch the line graph dipping down as you lose and record your weight. I have tried a few other apps and diets for that matter, but nothing made as big a difference to me. When my friends ask me how I'm losing so much weight I tell them about this app. Unlike other Apps, this one has a huge inventory of food items which eliminates the need to enter in the nutritional values for everything you eat like the other Apps. 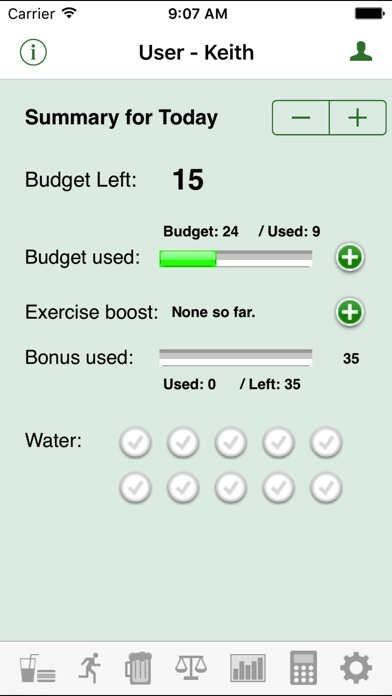 I have lost 2 pounds so far in 5 days by tracking points and making smart choices, which this App helps me to do. 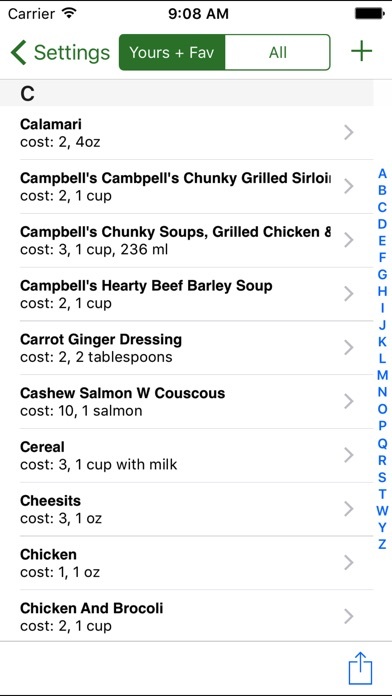 My friend tried another App and it has zero food inventory so she stopped using it because it took so much time to enter values for each and everything she ate. This App allows me to add foods if I need to but most of the time the item is in the inventory. Yay! Thumbs up! This App. Has helped me stay on a WW based diet plan. I have lost 7 pounds since I started using this app 2&1/2 weeks ago. I have done Weight Watchers in the past so I am familiar with the system, making this app very easy to use. Love the sounds that play when making entries. Nice touch. Two drawbacks are not being able to browse the food catalog unless you are making an entry. Same goes for adding food to the catalog. You can only do it through making a new entry. One of the access icons on the bottom should be for the food list. The water icon could be combined with the charts. There are some improvements I would like to see. First more foods on the list. The search engine for the food list is not the best and can be improved. Also add the ability to make recipes and add Them to the list. Activities are fine. Charts need More details and ability to look over more than a week on some items or the ability to make my personal chart. Love the summary page! This app requires way too much work. ifyou want a really good app to track food and exercise then try the iPhone version. It's called "lose it". It allows you to scan bar codes and records the info for you and it has lots of food and drink. It does not, however, list fresh fruit types. I've been using this app for a few years now. Makes keeping track of my points, weight, and exercise a breeze! Thanks for developing it!! Don't waste your money....app has several bugs, frustrating to use. It could be great, but bugs need to be fixed. I am also having crash issues , starts to open then closes. 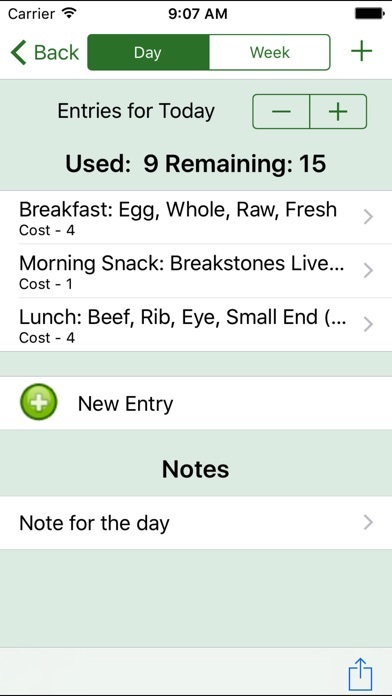 I find this app easy to use and a great help to keep track of all my eating point. I started using this app at 350 pounds and now I am down to 278 pounds. I am very thankful for the help this app gives me. A low cost alternative, exactly what I needed! I did the weight watchers at home flex points program 7 years ago and lost 80lbs. After putting back on a few lbs over the years I decided it was time to get back on the wagon. I still have all my program material from before, except now I can use my smart phone to calculate points values and keep track throughout the day. This app is basically a calculator/tracker from the old flex points system, but without the expensive membership. Thank you, Keith Kiser! Just downloaded and love this app! The database of food is huge and I love that I can easily add my own as well. Looking forward to getting to my goal weight with this! Having done weight watchers for the past year I was happy to find this track it app. I was unwilling to pay WW or continue with weekly weigh ins to get use of theirs. This app took a little time to get used to but once I had my favorites saved, daily tracking is easy. I don't get much use out of all the name brands and restaurant items in the lists as I try to eat fresh unprocessed foods. A suggestion to the app makers to include an area for daily notes was greeted with a prompt response and was up and working within two weeks. As with anything there has been a few little glitches but overall this FREE App works well for me. 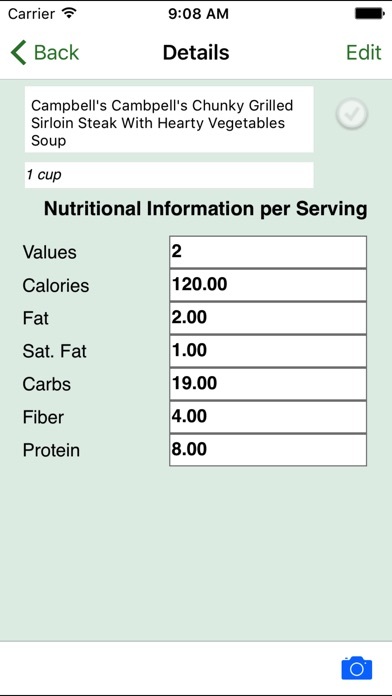 The free version is easy to use and has all the basic information needed to track foods, exercise and weight records. The subscription version offers more details and more record-keeping options, such as body measurements and BP. Very nice app. I have had this app for a few years. I used it religiously for a long time then life got crazy & I stopped using it. Ready to start again and my app wasn't working so I contacted developer & they were VERY helpful. Several emails later, I'm back on and logging. It's nice to be able to get such good personal (not canned) support! Crashed on start up, settings either don't work or sliders refer to wrong items, no alternatives for food measurements (e.g. Milk only in servings by cups, no option for tbs etc). Needs work to be useful. Just bought and deleted. Thankfully, only $.99. Lose It is far better, but not available on iPad. Don't you test your updates? I used this app everyday. Love it. Then an update comes and I get validation errors on weight entries and meal entries. I don't use your endless restaurant list or care about how many points in a Big Mac or doughnut. Sort of defeats the point of a diet. Please revert to the previous edition. Great app for tracking eating habits and keeping you honest. Really great if you are a weight watchers user and need something to track points. Best point counter! Very easy to use.Very good customer support This my 3rd review of this app. It is still a great app, very easy to use, Large data base. I have lost 64 lbs using it. Enter every item u eat!!! This is my 4th review. Has been updated with new data...Very GOOD customer service. This app really has helped me lose weight! Easy to use, once you get the hang of it. I love the "save your favorite foods" feature, which is a shortcut way to record your calories. And you can "create" your own favorite (I make a fruit shake every morning, so rather than enter all of the individual ingredients every morning, I just created one "favorite" with all of my ingredients and calories imbedded in one entry). One small criticism: I can't seem to get the app to delete a "self-created" favorite like my shake, so if I mistakenly enter the wrong # of calories for a favorite I create, I can't delete it and start over - or at least I can't figure out how to do it,, and the directions/help function doesn't say. (I'm hoping the creator will fix this soon.). But overall, this is a great app to help you lose weight, and it's easy to use, even for me, a 55 yr old woman like me! Not a user friendly as other apps but it does the job! It feels a little clunky and not as intuitive as other apps, but the flexibility to do calories or PP from Weight Watchers was exactly what I was looking for! For the price you can't beat it. And customer support has been awesome! Worth it! I absolutely loved this app until I updated it. It now won't even open let alone operate. VERY UPSET!! 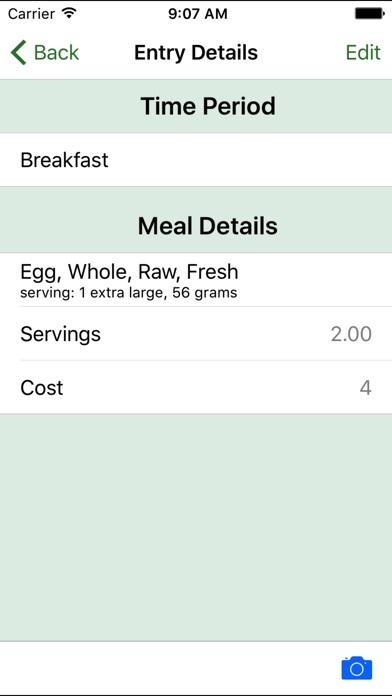 While it would have been great to have features that are relatively intuitive, like automatically saving selections to your favorites, or have a wider food base for the points calculation, if you don't mind entering the calculations for exercising and food, this app is pretty good, especially for something that has no ads like the other apps. Both my wife and I have already lost weight after 2 weeks, and are well on our way to our goal weight. Love the ability to track calories, weight loss, water consumption, and exercise. Graphs and charts are super. I had to give it 4 stars because it's frustrating to search for food items and impossible to edit saved food items. Works well for me. Zero crashes. Love this app. It is missing a barcode scan capability that other food trackers have. Love this app. Been using it for several years. Retains your weight loss progress. Really nice to be able to just look at icon and know how many points you have left and not have to open the program. This is a great tool for tracking the food you eat. Makes you aware and gives you some control. Love it. I've lost 10 pounds in 3 weeks. Finding the food choice seemed cumbersome at first, but once I figured out how to put foods on my own list and how to group them, its been easy. Highly recommend!